Celebrating Tu b’Shvat this year on an alien moon called Pandora? Why not? As seen in “Avatar,” the 3-D, billion-dollar grossing movie, it’s definitely a place where trees are revered. In the film, bluish people called Na’vi worship ancient trees. Here on earth, a Jewish people who have a “navi” or two of our own (navi in Hebrew means prophet) will celebrate Tu b’Shvat, the New Year for Trees, on Jan. 30, expressing in song and seder a kind of tree love as well. Why? Not a shock, since we are a people whose default metaphor for Torah, for ultimate knowledge and life, is “etz chayim,” the tree of life. On Tu b’Shvat, we behold the lovely shekadia, the stately almond tree, and her white blossoms that we praise in song. 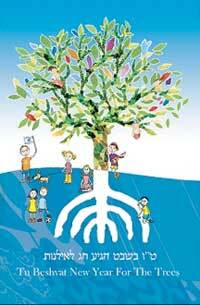 ‘Tu b’Shvat Tree’ from Posters of Israel, eme@postersofisrael.com. Additionally, trees need to be trimmed, watched over in wind, and protected from disease. And as in “Avatar,” zealous developers see them as obstacles. Shade, fruit, sense of place, cleaner air: We know about all that. Danish modern furniture, olive wood Shabbat candlesticks from Israel: We know about that, too. The tree is now diseased and requires special care, but its descendants, saplings, will be sent out around the world to more than 200 schools and locations, including 11 locations in the United States that showed, according to a piece in The New York Times, “the consequences of intolerance” – racism, discrimination, and hatred. Trees bring us understanding and friendship between neighbors. My parents always had a fig tree growing in their backyard in Anaheim, Calif. In the 1990s, their neighborhood and area saw the arrival of Lebanese and Palestinian households. The local newspapers even began to describe the adjoining commercial area as Little Gaza. As it turned out, the Lebanese family who moved in across the street planted its own fig tree. My father, Murray, died last year, and after his death I discovered that he and the neighbor had a wonderful relationship, exchanging fruits in their seasons and news of their families. I visited the Bristlecones one year, gnarled, twisted, ancient. If something can live that long, then so can our traditions and memories. We love our trees. Unlike the Na’vi in “Avatar,” we don’t sit around cross-legged and pray to them. Yet we do have a bond, a connection to our memories and humanity. This Tu b’Shvat, sans spaceships and 3-D specs, create your own special effect: Pick up a shovel, dig a hole. and plant something that will grow into the future.